This release continues the series of 4-CD sets which comprises selected annual collections of the biggest US country hits of each year. 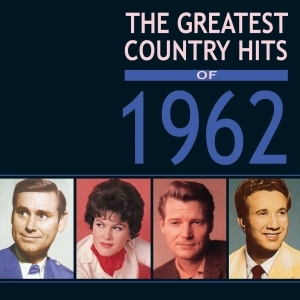 This great-value 110-track collection covers the year of 1962, during which time Billboard published a Top 30 which changed its name during the year from Hot C&W Sides to Hot Country Singles, and it comprises every record which appeared in the Top 15 of that chart during the year. Despite the fact that the pop landscape had been transformed over preceding years by rock ‘n’ roll and its aftermath, and was about to undergo another upheaval with the British Invasion, the charts still had a familiar look about them for country fans, with many traditional established country stars well-represented, like Webb Pierce, Porter Wagoner, Kitty Wells and Hank Snow, although the smoother Nashville sound certainly characterised many of the hits and there was more than a smattering of crossover artists who enjoyed big crossover hits, not least Leroy Van Dyke’s long-running No. 1 “Walk On By”. Other big winners during the year with multiple hits were George Jones, Patsy Cline, Marty Robbins, Jimmy Dean, Jim Reeves, and there were some hot new kids on the block like Buck Owens, Willie Nelson and Johnny Tillotson, along with some collectable obscurities among the one-hit wonders. It’s a fascinating and entertaining musical snapshot of the country scene during a dynamic era, and with an in-depth 12,000+ word booklet with background notes on every record, it gives a solid overview of the most popular country music of the year.